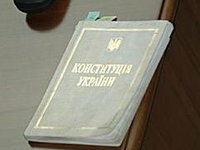 The new version of the Ukrainian Constitution must be published before the early presidential election on May 25, Ukraine's Prime Minister Arseniy Yatseniuk said. "I consider it necessary to unveil what the text of the new Ukrainian Constitution will be like precisely before the presidential election," the prime minister said at a meeting with Dnipropetrovsk region officials on Friday. All political forces should not just declare but sign the new version of Fundamental Law, Yatseniuk said. "So as to prevent the new president from trying to re-write the Constitution for himself," he added.